Susie, your arrangement today is simply gorgeous. I love how you’ve used the foliage, I would have expected the Acuba to be too heavy (I’ve never managed to make it work). But it fits perfectly with the much airier blooms. Thanks. With more time I’d probably have removed a leaf or two from the Aucuba. It feels a bit heavy. Had planned to have only a dot of color among the green foliage but couldn’t stop adding flowers! Thanks Cathy. My sarcococca is planted under a tree to give it the shade I heard it needs, and I barely every notice it. I love it! Beautiful purples and whites. 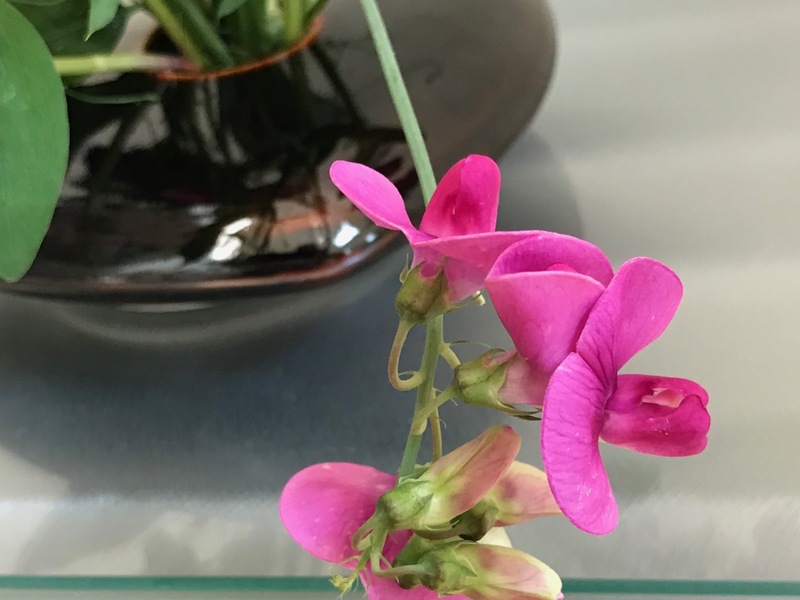 The unexpected magenta zing of the sweep pea makes the arrangement sing! Thanks Peter, I adore that little sweet pea because it came from a very special relative many, many years ago. What a beautiful arrangement Susie…each element is perfectly poised. Thanks for the close ups..the structure of flowers is so beautiful. Thanks Noelle. I agree flowers are fascinating up close. Gorgeous, I particularly love the Angelonia. Thanks, the Angelonia has been helpful keeping some color in my garden this summer. It’s very happy this year. 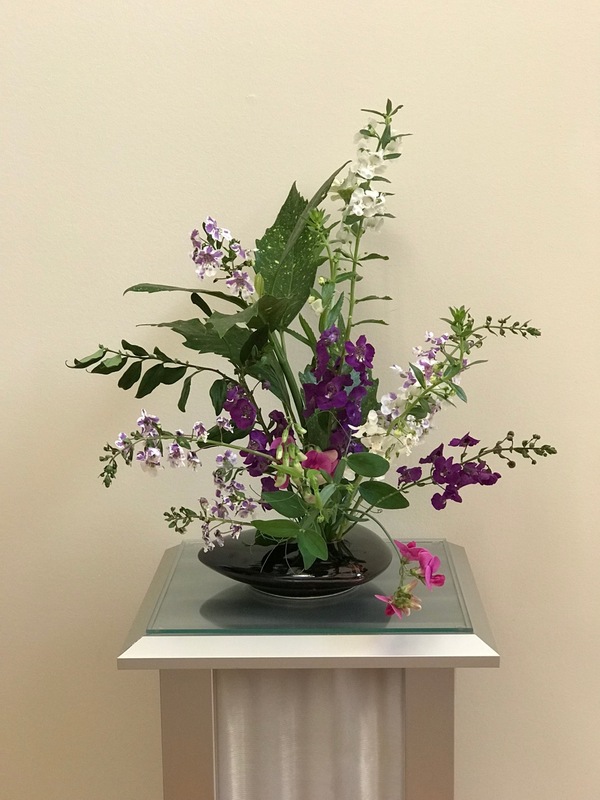 Since you are one of the few people who often uses a low, Japanese influenced vase, I always look forward to seeing when and how you use it. Somehow, whatever you put in it seems perfect. Thanks Linda. Some day I’d like to study Japanese arranging, but for now I just enjoy the practice almost as a meditation. Lovely as always! Is there a secret to growing Angelonia as successfully as you do? Mine are never nearly as impressive (as you may guess from the fact that I’ve seldom featured them in an arrangement). Kris, Angelonia just seems to thrive in this area. Wet or dry weather seem to be fine with it. I am a rare lover of Gold Dust Aucuba (used some in a client’s garden this summer) I think it goes well with many things like the Zinnia and Angelonia. Love it. Agreed, Gold Dust is nice for interesting foliage. Your arrangement fairly explodes from the vase. I admire the way you manipulate the stems to create that effect. Thanks Ricki, these arrangements come together quickly using the Ikebana vases. 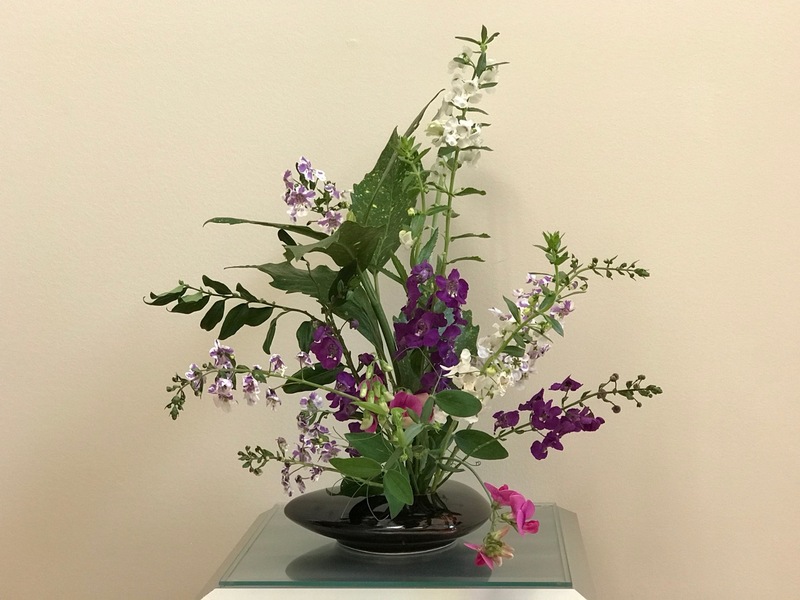 Angelonia is so pretty in a vase, isn’t it? So airy and graceful. I wish it had a slightly longer vase life, but it is so lovely for a few days. Great arrangements, as always! Thanks Beth. Angelonia is such a good worker outdoors. 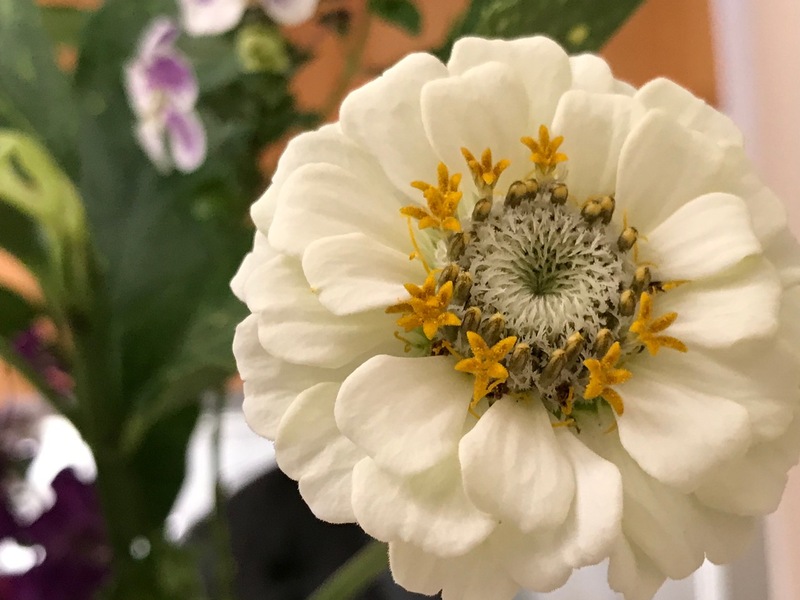 It’s a little tricky to use in vases but nice for variety from my zinnias! Take care. 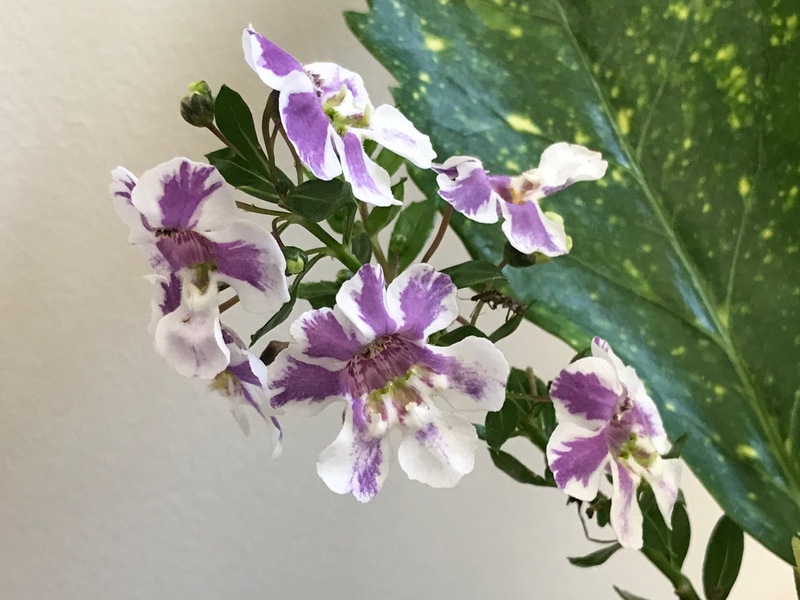 The bicolor Angelonia is so lovely – your arrangement reminds me of those painted ceramic dishes from the Victorian era. Beautiiful! How lovely of you Eliza. I’ve never seen bicolor Angelonias like those. Very nice. The bicolor angelonia is new to me this year. It performs well (as do the others). Carefree works for me. Angelonia is not something I am familiar with. It is intriguing. It is an annual, used extensively here in commercial landscaping–needs no care. Beautiful collection and variety of flowers and foliage arranged to perfection.